With a Russian/Dutch heart: Happy with a new flooring, LOL! Happy with a new flooring, LOL! We had a good weekend, I can say. First of course because the weather was so nice, specially Saturdyay, with lots of sunshine. Friday i did some boring house stuff, but it has to be done, and in the afternoon Jan went for a walk(he can do that now, although slow pace and feeling very tired after it), and when he came back, he bought a universal remote control. Sometimes it is so confusing with all the remotes at the coffee table, and specially the remote control from the tv didn't worked very good anymore, which is very frustrating. But as he showed me his buy, I already knew there would be trouble to get everything working on the new control LOL! And I was right. They always say in the users guide it is so easy, and it probably is, but we ALWAYS struggle with those kind of things. Most annoying was trying to get the digital tv receiver working on it, and whatever we tried no luck. But okay, at least we can skip the tv remote control, of which the little buttons for several functions almost didn;t work anymore. Jan got the dvd working with the new remote control too, so it makes life a tiny little bit easier. Saturday we got up a bit earlier and went to the market. We came home with all kind of veggies and fruit and cheese, and I must say that the part with the new stands look very nice, but on the other hand it takes away the special feel of a market. No, I didn;t make any photos, because I just forgot to take my camera. Yesterday we were supposed to take it real easy and quiet, but at a moment, I missed Jan for a longer time so I went looking for him and the idiot was cleaning the kitchen floor. Nice of him, but I don;t want him to do too heavy work yet, ahhhhhhhhhhhh men are sooooooooooooooo difficult. But he stayed away from the living room so after a while I went cheking again and I went kind of crazy, because he had taken the linoleum( well, it is kind of different stuff, but I don't know the right word for it at the moment) that we once bought for the kitchen floor and busy cutting it and placing it on the kitchen floor. Oh my, I told him off, without any success, so what else to do then getting on my knees and helping him cutting it and such. Not that it is on the floor it looks as if we have a total different kitchen, that even looks bigger too. Yeah, it really looks different from the wooden floor( just the common wood they use for flooring), and now that it is done(still have to do a small corner) I am happy. But I could notice it was a bit too much for Jan, because he was real tired after it and I still am not happy with the fact he did the job at this time. May be I am over-protective, Jan says I am and that i worry too much. Today I probably will do some shopping, because we need cat food and bread and coffee, and I better do it today, because tomorrow the weather forecast tells us we will have lots of rain, and very strong wind(which is always dangerous for me, grin ! ), and this week temperatures dropped for about 6 degrees. already today it looks like real autumn weather, cloudy, with a little sunray peeping through, but also wind and rainclouds arriving. So we are waiting for the home care to come for Jan's bandage( his leg is looking already so much better, almost normal size again) and then I will get dressed and leave quickly. So this our weekend, more or less. Time now to give you something for your scrapping. 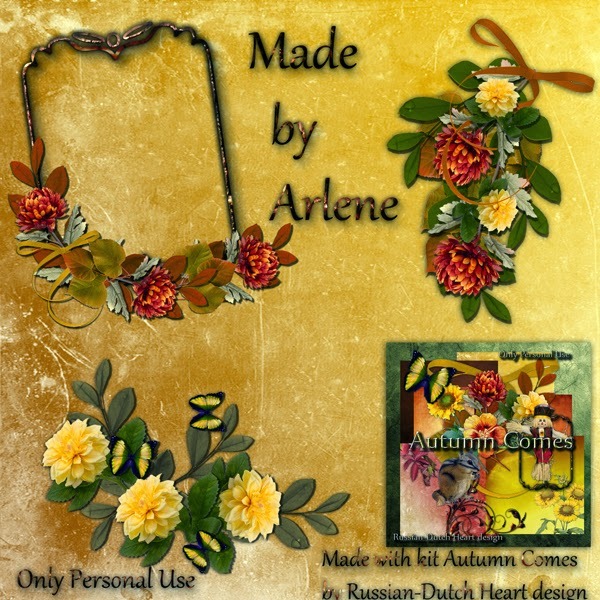 I have some lovely clusters from Arlene made with the Autumn Comes kit. And good news, I started already a new kit. Going slowly, every time I open PSE I just make two papers or so, but it's progressing. Not promessing anything about the date it will be ready, I noticed that lately that isn't working very well ROFL. Arlene's clusters are lovely. As for the kit designs, take your time. It will all come back. Hopefully, Jan will slow down a bit before he lands back in a sick bed. Men just don't seem to understand how important it is to let the body heal. We have a few wet days coming up shortly. According to the weatherman, it could be a real Nor'easter. Lots of wind and rain. Hmmm, we'll have to wait and see. Now it's time for me to get busy here. I need to do some laundry, and then get back to my stitchery. You have a super day, hugs, Edna B. Thank you for this beautiful download. Hello and Thank you for this lovely download. It doesn't matter how long it takes for you to make the kits - the main thing is that you enjoy making them.